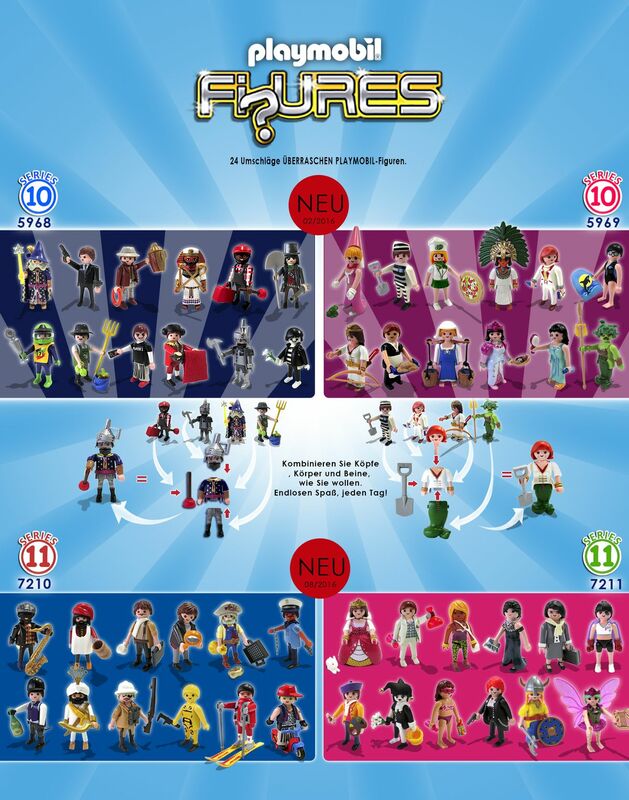 Toyriffic: Playmobil Fi?ures Series 10 and 11 Revealed and...izzat you, Harley Quinn?!?!?! UPDATE: These Playmobil Series 10 and 11 Fi?ures are customs and NOT actual upcoming Playmobil releases. 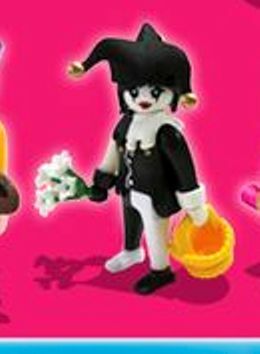 Ok so it's an official Playmobil Harlequin...but I have to believe Harley Quinn served as inspiration for this upcoming Playmobil blind bagged Fi?ure! 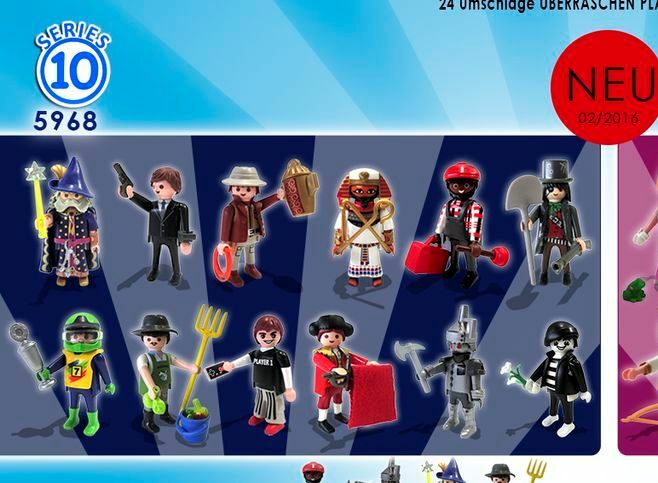 Toyriffic reader Dmitry sent a link to this image which appears to show the upcoming Playmobil Fi?ures Series 10 and 11. It looks real enough to me, and since the Harlequin is part of Series 11 I hope and pray it is because I need like fifty of them! Grave Digger? Slash from Guns and Roses? Lots of great klickys in this wave. Tin Man is a must-have. And note: the whitefaced grinning mime could easily be customized into a Joker with the addition of green hair! Yeah, I have to have Medusa. Multiples in fact. That hairpiece and snake body will be great for use on a Medusa army of klickys! Note the green hair on the Hip-Hop kid - perfect for your Series 10 Mime to turn him into The Joker! I think I want the Crash Test Dummy for sure. Yeah, ok, I will simply have to own fifty Harley Quinns (I mean Harlequins) for Harley Quinn customs. I will of course also have to have at least one that I don't alter one single bit because she is a pretty awesome klicky in her own right. Release dates are clearly for Europe, and usually the US is a few months behind. It's going to be a loooong wait, but some of these Fi?ures (Harlequin!!!) look to be worth it! I'd like to think that fancy lady was somehow inspired by the "Blank Space" music video, but the hair color was changed to black so as to avoid too much suspicion. If/when these come out, my first purchases from Series 10 will be MEDUSA! (deja vu from the last Series 10 I collected-from LEGO), the Tin Man, and the Mime. S11 priorities would have to be the Harlequin and the Crash Test Dummy, who is perfect for a theme of figures that are meant to be dissassembled. Just thought I'd point out the suspicious elements. 1, The product numbers are already taken, and the catalog spread does not match the 2015 catalog page for Series 8 and 9. This could just be a preliminary catalog page or a regional difference, though, and it will be finalized later. These pics were also found on Pinterest, and it's quite a bit early for such info to be released. 1. Huntress is facing away from the viewer, and a few of the characters are out of scale, like the S11 Fairy. 2. Arabian Warrior is blocking the Barman's feet. 2. The Aztec Goddess is implausible. 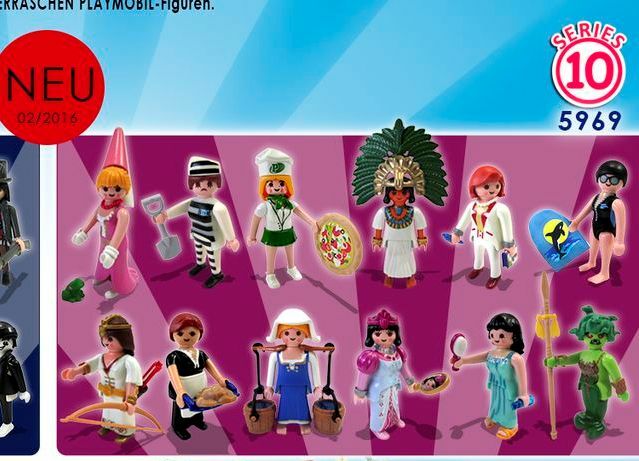 Her headdress does not have any connection points for the leaves, so that's certainly suspicious... Also note that Playmobil reserves that hair for males, but here, two females have it. 3. Boxer Lady reuses S7 Ice Cream Girl's torso. Playmobil is prone to reusing figure parts, but they've never done it within the Fi?ures theme. 4. Asian thug kid has short baggy pants. Only one pair of short "adult-size" legs has been made for dwarves, so a short version of the baggy pants seems odd and rather specialized. Also, both he and the Gamer reuse the Punk Rocker's pants design. To be honest, the figure makes no sense at all. Why green hair? Why a scooter? 5. Harlequin's golden bells seem implausible. That jester hat is uncommon, but I don't think it's been printed before. Regardless, I think there's a lot saying these ARE REAL. The shadows and alternate angles in the combination examples seem to prove it, so perhaps it's an early version of the catalog, PLEASE let this be happening! I hear you on all counts - and I was certainly torn when I first saw this as to whether or not to trust it. But it's SO well done! And if you were going to fake something like this, who go out of your way to make lame figures like a boogie boarder or bread maker? If it's fake, I can only guess that it's a collaborative effort by a group of speculators or customizers as to what they'd like to see in future releases. But even that would be tough to pull off with such uniformity. Perhaps all the shots were taken at a custom-con or something, and someone made a catalog page from them. I'm inclined to believe it's real and that it's a very early mock-up. But I just want that harlequin to be real, so I'd believe anything. I'm with you all the way. That was my main line of reasoning: who would bother creating their own series with intentionally boring figures? Unless they're really cruel, nobody would bother going to this much effort to fool someone. Even if it isn't real, whoever made this has an excellent understanding of the charming, awesome, and just plain odd aspects of the Fi?ures theme-which is why it's more likely to be real! 2016 is gonna be an awesome year for Fi?ures collectors and DC Comics fans. I'm still waiting for the (presumably July) release of Series 8, though! The Grave Digger could also be Alice Cooper too! I'm taking another longing look at these, and that idea of these being a collection of predictive customs is scarily sensible. That's why the Harlequin's hat looks like it has a fuzzier finish (paint) and why the Fancy Lady's too glossy. There are a few direct piece reuses (Fairy's hair, Boxer's torso, Swimmer's torso, Wizard's robes) and it would explain the large amount of copied LEGO minifigures. The impossible pieces like the leaves on the golden crown or the short baggy legs could also be custom work. BUT Medusa's snake tail and all of the new prints look way too real to be custom, and it looks very professional, so I'm sticking with the "mock-up page" theory to calm my nerves. I'll also remind myself of Playmobil's tendency to get rid of leftover pieces by reusing them. It's just too well done to be an amateur mock-up. A Playmobil mock-up however...I could see them using those parts over for their mock-up (like, here's what the boxer will almost look like, but we haven't made her torso yet type thing.) IF someone not assocciated with Playmobil made these, you'd think their work would show up somewhere else as this isn't someone who tossed together a couple customs over the weekend. This is someone who does this seriously, if not an actual Playmobil employee. So do I. I'll believe anything if it means we're getting that Medusa and Harlequin! One final thought (I promise! ): I'm pleasantly surprised that Playmobil chose the black jazz musician to be the "mascot figure" for Series 11's boys. It's not that they're directly offensive to anyone, but they're from a fairly non-diverse part of the world, so this is nice to see. Now I know you can write whatever the hell you want when you pin something, but the term 'unreleased' seems an odd choice - if someone was not hiding anything, would they not have said 'custom' or if someone was trying to fool us all shouldn't they have said 'coming soon!' ... I don't know, not definitive either way, but it could certainly be interpreted as a sign that these are legit. I thought that was an odd way to phrase it, especially since "unreleased" can mean both "upcoming" and "cancelled". The Video Game dude looks like the one from LEGO Minifigures series 12. 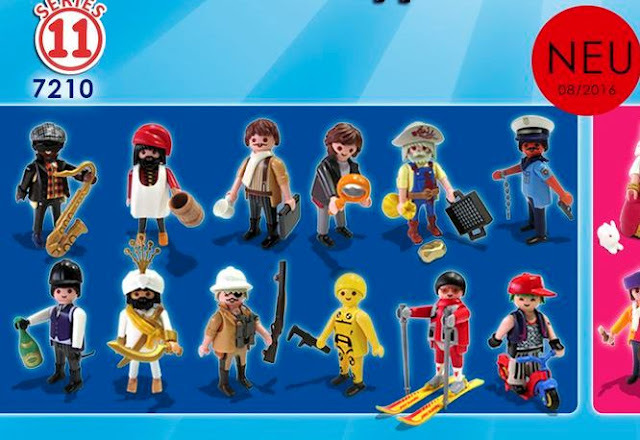 Maybe playmobil is trying to ripoff LEGO Minifigures series. This is more disappointing than before. 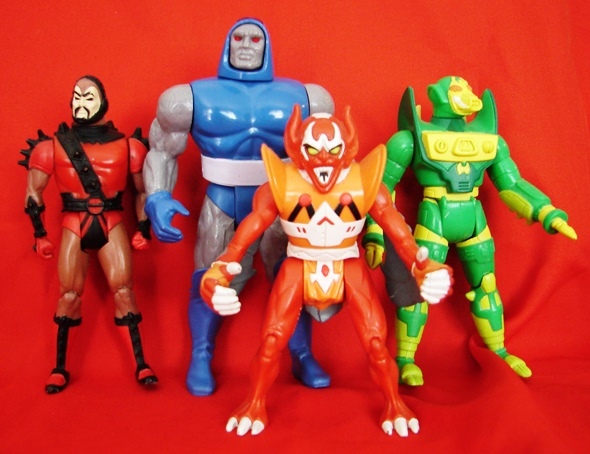 There's been cross-over before between the two releasing similar figures. But it could be taken as evidence that these are not official as someone could have easily been emulating LEGO in their custom designs. They never made a Game Designer or Animator figure in both Playmobil and LEGO right Eric? However, some of the companies are free to do what ever they want as long as they don't infringe any copyright laws. 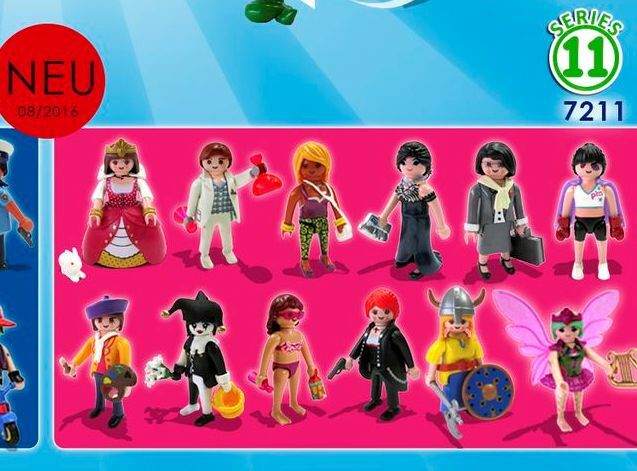 Please Playmobil, remove that creepy looking gamer from the list for Series 10 before LEGO can sue you. They haven't yet but only time will tell if these are official or some customs! Well, his shirt is a direct copy of LEGO's, and his face has been used before. He's one figure I wouldn't miss if these turned out to be fake. Hello, I'm just back from Germany and I can confirm that NEITHER the UK NOR the German catalogue have a series 11 AT ALL!!!!!!!!!! Gutted. Are they stopping the bags?????? It's interesting to see how the final line up of Series 10 changed (http://retroplaymo.blogspot.com/2015/12/playmobil-figures-series-10.html). I love the bizarre and cool Stilt Ghost! Also, we ended up with another vampiress in the Series 10 Girls line up!